Isaac Chanler born 1700 is the earliest known ancestor of the genetically distinct family designated #31 by the Chandler DNA Project. Chanler is an established variant of the Chandler surname. Isaac Chanler was a Baptist minister on the Ashley River in South Carolina (near Charleston). For a time he was the only ordained minister in a large area. One 19th century author, when writing the history of the Baptist Church in South Carolina, said, “Mr. Chanler was a man of distinguished talents, piety and usefulness.” There is one descendant of Rev. Isaac Chanler in the Chandler DNA Project. A new Ashley River Church, the second Baptist church in South Carolina (Charleston had the first), was formed on May 24, 1736, with 28 male and female members. The constituents were Isaac Chanler (pastor), William Cater, John Bullein, Richard Bedon Jr., Benjamin Child, John Sheppard Jr., Charles Barker, Charles Filben, Francis Sheppard, Alexander Sheppard, Jacob Bradwell, John Angell, Thomas Ramsay, Richard Bedon Sr., Sarah Baker, Mary Cater, Susannah Bradwell, Christiana Brown, Ann Maam, Elizabeth Chanler, Elizabeth Bullein, Joyel Griffin, Elizabeth Bedon, Elizabeth Salter, Susannah Baker, Elizabeth Marrion, Mary Sheppard, and Ann Peacock. According to Isaac Chanler descendant Lew Toulmin, early histories of the Baptists in South Carolina indicate that the Ashley River settlement where Chanler was minister was near the settlement of Dorchester, about 30 miles northwest of Charleston. The Ashley River settlement no longer exists, but is commemorated by a state park. Drawn during the lifetime of Rev. Isaac Chanler, this is a detail from a 1733 map of the United States by Herman Moull. The city of Charleston is located at the confluence of the Ashley and Cooper rivers, which flow together into the Atlantic Ocean. 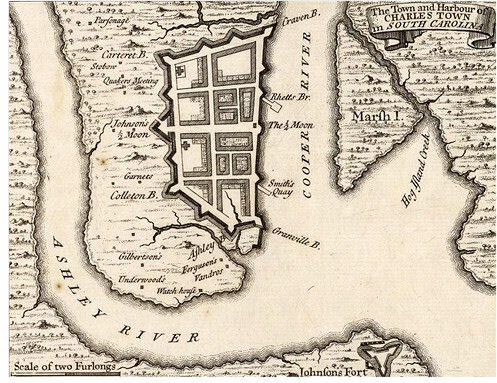 Charleston was originally located on the west bank of the Ashley River and was later moved to the peninsula across Cooper River where Historic Charleston is located today. Map and facts courtesy of Wikipedia.com. Notes: The letter S is inconsistently written, with two versions of the long form letter S as well as the modern form. For example, the island in the Cooper River is Marsh Island, not Marth Island, and the place northwest of Charles Town shown as Parfonage would be Parsonage in modern script. Two furlongs (see map scale) is a quarter of a mile. Rev. Chanler was a published author. One 438-page work, described as “a treatise in small quarto” and “esteemed an able defense of the Calvinistic doctrines”, was published in 1744 under the impressive title “The Doctrines of Glorious Grace. Unfolded, defended, and practically improved. Herein The Fall of Mankind in the first Adam, and the Methods of divine Sovereignty in the Effectual Recovery of a chosen Remnant by Christ, the second Adam, are declared, and set in a scriptural Light”. This was said to be probably the first theological work published from that area of the United States. Another publication had a simpler title: “Treatise on Original Sin”. A diary left by Rev. Chanler was published in 1898. At the end of the book, his great-granddaughter, Caroline Ann Marshall, provided biographical details gleaned from “History of First Baptist Church, S.C.: Two Centuries of the First Baptist Church, S.C. 1683-1883”. The Baptist history gives Rev. Chanler’s birth date as May 10, 1700, and birth place as Bristol, England. He married Elizabeth Hunley, born Uxbridge, Hertfordshire, England. Their children were Mary, Isaac, Susannah, and Ann. The journal tells of traveling from Christian home to Christian home in his district and receiving a warm welcome everywhere. He valued his church work, his family, and his many friends – and also a good night’s sleep. Most diary entries begin with gratitude for a restful slumber. Rev. Chanler died on November 30, 1749, at the age of 48. He left a long and interesting will dated May 20, 1749. Elizabeth died in 1774. Rev. Chanler’s diary is available to read online at the Lowcountry Digital Library. Isaac’s daughter Mary married William Morgan on 4 January 1770 in Charles Towne, South Carolina. William was a wealthy merchant and planter who supplied provisions to the Continental Army during the Revolutionary War. He was born in Scotland, probably County Fife, the son of another William Morgan, and came to South Carolina in about 1750-1760. Mary died about 23 November 1779 in Charleston, South Carolina, and William died between 1782-1784, probably in Dorchester, South Carolina. Dr. William Morgan – born 1775 Charleston, South Carolina; died 2 July 1809, Charleston, South Carolina. William graduated from medical school at the University of Pennsylvania in Philadelphia. He married Elizabeth Stewart on 6 November 1798 in St. George Anglican Church, Dorchester, South Carolina. Elizabeth, daughter of Daniel and Sara Stewart, was born November 1776 in South Carolina. William died of pleurisy and consumption at the home of Elizabeth’s brother, Captain James Rousham Stewart, and is buried in Summerville, South Carolina. Elizabeth moved to Alabama in 1821, eventually settling along the Alabama River in Day’s Bend, Autauga County, with her four children and various slaves. Elizabeth died 19 February 1855 in Day’s Bend, Autauga County, Alabama. This branch of the Chanler/Morgan family flourished in Alabama and is well documented. Descendant Lew Toulmin provided many details from his mother’s research and his own records. James Stewart Morgan – born 10 December 1804 near Charleston, SC; died 15 January 1849 near Shiloh, Marengo County, Alabama. He married Susannah Goodwyn Lloyd in Autauga County, Alabama in September 1828. She, the daughter of Thomas Lloyd and Ann Goodwin, was born 13 March 1808 in or near Milledgeville, Georgia, and died 11 November 1865 in Marengo County, Alabama. William Daniel Morgan – never married. Elizabeth Mary Morgan – born about 1799; died 1843 in Marengo County, Alabama; never married. Isaac Chanler Morgan – born about 1809, died 22 July 1871 in Day’s Bend, Autauga County, Alabama. Isaac Chanler Morgan – carpenter, married Elizabeth Logan, six children, lived in Charleston, South Carolina. The South Carolina census for 1790 shows Isaac Morgan living in the Edgefield District with one male over 16, 1 male under 16, and 1 female. Mary Morgan married Clement Prince. They had one son, also named Clement. Isaac, only son of Rev. Isaac Chanler and wife Elizabeth, was among the first native-born South Carolinians to earn a medical degree. He studied at the University of Edinburgh before returning home to South Carolina and was among the founders of what became the Medical University of South Carolina. He was president of The Medical Society of South Carolina in 1800-1801. He married Sarah White on April 17, 1771. A portrait of Sarah White (Mrs. Isaac Chanler) by Henry Benbridge (1743-1812) can be found on numerous websites, including 19th Century American Women. Mary Susanna Chanler, born about 1772. John White Chanler, born about 1773. Sara Chanler, born about 1775. A Charleston city directory shows Dr. Chanler living at No. 54, Broad Street in 1790. A second marriage to Catherine McCord, a widow, on 20 December 1800, was short-lived. Isaac returned to Scotland for further medical studies and died there in 1801. Green, Samuel of the Island of Hilton Head, planter, & Susannah Chanler, daughter of Rev. Mr. Isaac Chanler, late of Charles Town decd. (already married)[sic], 25 Jan. 1770; Charles Grimball, Isaac Chanler, trustees; William Morgan, James Taylor, wit. According to documents in the possession of Lew Toulmin, the trustees were charged with preserving Susannah’s legacy from the estate of her father of 400 acres and 10 slaves. Her brother-in-law, William Morgan, was one of the witnesses to the marriage. Ann Chanler married Alexander Marshall. He was a doctor or apothecary who practiced with Ann’s brother, Dr. Isaac Chanler, in Charleston. Ann and Alexander are believed to be the parents of one child, Thomas, born 1765. Thomas died in 1801. Note: Many of the sources referencing the Morgan family in the end notes below were provided by Lew Toulmin from his files. We offer sincere appreciation to Mr. Toulmin for his assistance with the story of Isaac Chanler and his descendants. 5Llewellyn M. Toulmin, “Descendants of Isaac Chanler” (family tree report). 7National Book Auctions website, http://www.nationalbookauctions.com/04052009/5apr097.htm (Search page for term Chanler)(April 5, 2011). 11Isaac Chanler, Diary of the Rev. Isaac Chanler , Low Country Digital Library, http://lowcountrydigital.library.cofc.edu/cdm4/document.php?CISOROOT=/WKF&CISOPTR=771&REC=3 (April 12, 2011). 13Chandler DNA Project, https://www.chandlerfamilyassociation.org/dna-project/ (April 12, 2011). 14Mary Morgan Duggar Toulmin, The Morgan family of Lloyd Llewellyn Duggar, Mary Morgan Duggar Toulmin, Helen Kathryn Duggar Conwell , manuscript, copy in collection of Mobile Public Library, Mobile, Alabama. 16Mary Morgan Duggar Toulmin, The Morgan Family . 22Mary Morgan Duggar Toulmin notes from cemetery visit in Dayton, Alabama, and on the Stewart burials from Thomas J. Morgan’s “Recollections” (manuscript). Mary Morgan Duggar Toulmin, The Morgan Family . 23Ellen Elizabeth Morgan, The Morgan Record , manuscript written about 1902, in possession of Llewellyn Morgan Toulmin. This death was reported in City Gazette and Daily Advertiser, 14 Jul 1809; see South Carolina History & Genealogy Magazine , Vol. 33, No. 2, April 1932, 141. 24Mary Morgan Duggar Toulmin notes. 27Mary Morgan Duggar Toulmin, The Morgan Family . 30The Medical Society of South Carolina, http://www.medsocietysc.com/ (April 12, 2011). 31 Marriage Notices in The South Carolina and American General Gazette, From May 1766 to February 28, 1781, http://www.accessgenealogy.com/scripts/data/database.cgi?ArticleID=44076&report=SingleArticle&file=Data (April 12, 2011). 33Jacob Milligan, Intelligence Office, The Charleston Directory; and Revenue System of the United States, 1790 (Charleston: T. B. Bowen). 34 South Carolina Marriages, 1800-1820 , ancestry.com, Chapter C, page 22. 35Mary Morgan Duggar Toulmin, The Morgan Family . 36 South Carolina Marriages, 1688-1799 , ancestry.com, Chapter G, page 101. 37Mary Morgan Duggar Toulmin, The Morgan Family .